Although my confidence in baking is pretty high, I have very little confidence as a chef. (I’m sure that’s obvious from the amount of sweet vs. savory recipes I post!) Countless times, I have relied on this simple recipe, one I developed over time from another given to me by a friend, to fall back on when I wanted to serve something that wouldn’t disappoint. I can always count on it–it never fails me. Mother’s Day potluck? Bringing these enchiladas. Family reunion? Bringing these enchiladas. Friend coming from out-of-town? Serving these enchiladas. Providing food for the grief-stricken survivors of a lost loved one? It’s gonna be these enchiladas. Preacher and his wife coming to dinner? Definitely serving these enchiladas. These aren’t just my favorite enchiladas, this are my favorite dish, period. It might not top your list of favorites, but I do know that everyone I serve them to really enjoys them as well. Dinner guests don’t always do the eye roll and moan that I usually do with the first bite, but they always give rave reviews. Although I tend to think of anything that contains “cream of fill in the blank soup” as ghetto food and try to avoid it, I’ve tried leaving it out and subbing more sour cream but it really does taste best with the stupid soup. Two tips to get the best flavor: shred your own cheese instead of buying pre-shredded and be sure to buy PACE brand picante sauce. Here’s why. Pre-shredded cheese is coated with some sort of junk* to keep it from clumping together in the bag, but it also inhibits the beautiful gooey melt we desire. It will melt, but not as well as cheese you shred yourself (see photo below of pre-shredded cheese-topped enchiladas compared to first photo for proof). I was also astonished to discover that shredding your own combination of cheddar and Monterrey Jack tastes ten times better than using the Mexican cheese blend. Strange, but true. As for the picante sauce, this is probably the only time I’ll ever insist on not going generic (I’m the Queen of Generic, FYI) but the flavor of the sauce really enhances the enchiladas and generic just really isn’t as good here. I don’t even know if it would be as good with some fancy-schmancy expensive stuff but since I haven’t tried it, I won’t forbid it. If you go for the fancy schmancy, let me know how it worked for you! OK, enough talk. 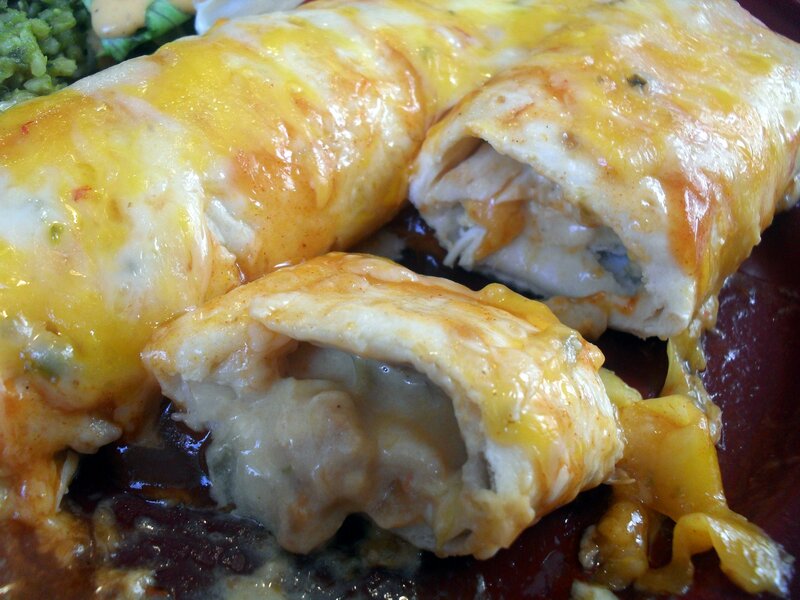 On your mark, get set, go make these enchiladas! Preheat oven to 350 degrees F. Grease a 13×9 and a 9×9 pan with butter and set aside. In a medium bowl, combine the chicken, onion, sour cream, soup, green chiles, 2 1/2 cups of the cheese (reserve the rest for the top), salsa, garlic, salt & pepper. Heat the tortillas in stacks of six by wrapping them in a damp paper towel and microwaving for 50 seconds. Rub a stick of cold butter over one side of each tortilla while they’re hot, turn them over, and begin filling them. Use about 1/3 cup per tortilla. Place seam-side down in pans. Once assembled, pour the enchilada sauce evenly over them (I use a pastry brush to get it evenly spread), cover the pans with foil and bake in for 30 minutes. Remove foil, sprinkle the cheese over the top and return to the oven for 10 minutes or until cheese is melted. Remove from oven and let sit for a few minutes before serving (they’re easier to move from pan to plate after sitting a little bit). If you are making them in advance, assemble them in your pans but don’t put on the sauce. Keep in the fridge covered with plastic wrap. When ready to bake, cover them with sauce, swap the plastic wrap for foil and bake for 40 minutes, then uncover and top with cheese before returning it to the oven for an additional 10. These can definitely be frozen but since but I haven’t tried it yet, this is just my theory on how that should be done: after filling the pan with rolled enchiladas, go ahead and pour the sauce on top and sprinkle on the cheese. Cover and freeze. You could probably bake them from frozen, but you’d have to bake them at least an hour, covered, and an additional 10 uncovered. You could also defrost them in the fridge for a couple days before baking, then bake covered for 40 minutes and uncovered for 10. Believe me, it tastes better than it looks! *I learned this from Mel at My Kitchen Cafe, whose husband works at a cheese factory. Ever since she mentioned this in one of her blogs (can’t remember which), I’ve shredded my own cheese and haven’t looked back. It really is worth the extra minute or two it tacks onto the preparation. If you’ve never been to her blog–check it out and browse around. Hers is my favorite food blog and I make more dishes from it than any other. Family friendly, comfort, down-home cookin’ dishes is what she offers and that’s what I’m comfortable with & enjoy eating most. 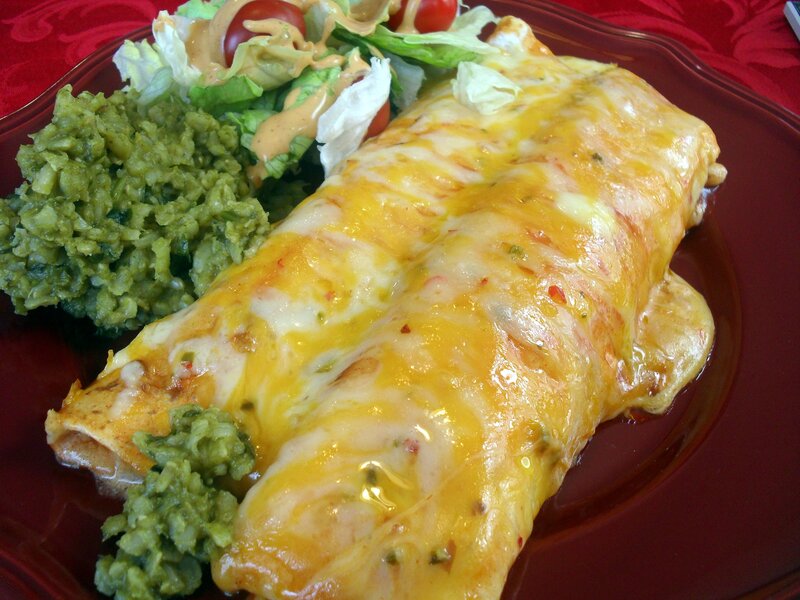 *Veronica’s Note: I almost always serve these enchiladas with green rice, another tried-and-true recipe that I’ve been making longer than the enchiladas and it always gets as many compliments. If you want that recipe, click here. Posted in Main Dishes, Mexican, My Favorites. Bookmark the permalink. Thank you for shareing the recipe. What I find so interesting is you could never find this ahnywere else. Haha–you can bet we’ll be eating these for one meal! I can’t wait till you visit! Veronica – how nice are you?? I’m so glad you like my food blog and the shredding cheese tip is a good one to add to your kitchen tip arsenal. I think the enchiladas look absolutely delicious! Whee! I feel like a celebrity blogger just autographed my post. Thanks, Mel. those look amazing. I’ve allready sent it to the printer. Can’t wait to try them!! Yipee! I hope you like them. I just made a vegetarian version of this and it was quite good! I used cream of mushroom soup, a large bag of frozen spinach (defrosted and drained) and 1.5 cups black beans, very tasty, thanks for the recipe! Great idea! My vegetarian version was a little disappointing, and I think it’s because it lacked the canned soup. Great idea subbing in cream of mushroom! I’ve also made some spinach and black bean enchiladas, but I bet using those ingredients with this recipe would be so much better. Thanks for the great idea! OMgosh! I have been using your recipe site for a while and I keep finding great recipes. It’s like you have an insight into my food soul! Thanks V! How interesting about the shredded cheese, I think I will be buying more bricks instead of bags going forward! The enchiladas look amazing also! Making this for dinner tonight! It looks delicious. I have also heard about the pre-shredded cheese having stuff on it. According to who I heard it from it is some extract or something from potatoes that prevents it from sticking to the other pieces. Even if it is potato, I still don’t want it on my cheese! I try to buy block cheese and shred it myself whenever possible.